Click here for audio of Episode 511. Today, science masquerades as magic. The University of Houston's College of Engineering presents this series about the machines that make our civilization run, and the people whose ingenuity created them. 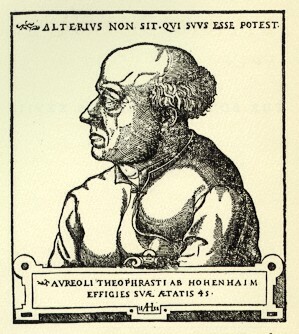 Philippus Aureolus Theophrastus Bombastus von Hohenheim was born in Switzerland in 1493. But he called himself Paracelsus. He learned medicine from his father. He learned metallurgy as a lad working in the mines. He became a wandering scholar. I am ... greater than those to whom you liken me ... I can prove to you what you cannot prove ... [each] little hair on my neck knows more than you and all your scribes. He nearly settled in Basel when he was 34. The great early printer Frobenius was ill. No other physician could help him, so he turned to Paracelsus. Frobenius must have been desperate. Yet Paracelsus cured him. Next, Paracelsus became physician to the scholar Erasmus. He found a place in Basel. But within a year he lit a bonfire in front of the University and threw the standard medical text into it. He might have survived the faculty's rage, but then Frobenius died, after all. When he did, Paracelsus's protection died with him. He spent the last 14 years of his life wandering. Governments banned his books. Yet, in the end, he conquered history. He became the most famous alchemist of all. A huge sanity lurked under all his madness. He told doctors to be far more careful in dosing people with mercury. He began reshaping the essences of earth, air, fire, and water into a concept of chemical elements. He told his followers to monitor medicine more carefully and to analyze symptoms. Creative people see Paracelsus's secret. He fit no mold. He was not Aristotelian, nor Platonic, nor a witch doctor. Oh, he spoke in the language of Platonic ideals and magic. But the magic he helped us see was really the magic of nature itself. He used his eyes as well as his head. We would have forgotten him, but he left a legacy that would not be forgotten. He'd written in German instead of Latin. As people turned to the new medium of print, they hungered for books they could read. So they read Paracelsus. It was the printers who saved him, after all. 300 years later, modern atomic theory grew out of changes he'd set in motion. So did modern medical science. And we're left with a hard message. Creative people don't look the way we want them to look. One way or another, they're always a trouble to our mind, because they take us where we hadn't meant to go. Debus, A.G., The English Paracelsians . New York: Franklin Watts, Inc., 1966, Chapter I.
Paracelsus, Paracelsus: Selected Writings (Jolande Jacobi, ed. ), Pantheon Books, 1951. For more images of Paracelsus, click here or here.